The Athens County Engineer’s Office is advertising for bids on the New England Rd Slip Repair Project. Look at the Bids and RFP’s page under the “Information” menu for more details. The Athens County Engineer, Jeff Maiden, will be accepting applications for temporary full-time laborers. The positions will last up to 120 days. The deadline to submit the application will be Thursday, June 4, 2015 by 3:30 pm. See more under “Information” tab – Job Opportunities. The Athens County Engineer’s Office will be closed on Friday, January 2, 2015. The office will reopen on Monday, January 5, 2015 at 7:00 am.  The Athens County Engineer’s Office is advertising for bids on two projects: ATH-FEMA Landslide Repairs Phase 1 and ATH-FEMA Landslide Repairs Phase 2. Look at the Bids and RFP’s page under the “Information” menu for more details. The Athens County Engineer’s Office is advertising for bids on the CR97 Pearlwood Rd Slip Repair Project. Look at the Bids and RFP’s page under the “Information” menu for more details. The Athens County Engineer’s Office is advertising for bids on the Salt/Grit Storage Structures and Concrete Slab Project. Look at the Bids and RFP’s page under the “Information” menu for more details. The Athens County Engineer’s Office is advertising for bids on the ATH-CR7 Road Reconstruction Project. Look at the Bids and RFP’s page under the “Information” menu for more details. A bridge opening ceremony will be held at the new bridge over Sunday Creek on Athens County Road 28 (McDougal Road) on Tuesday, June 17th, at 3:30pm. Construction began in the fall of 2013, and will be completed on Tuesday prior to the ceremony.